An FIR has been lodged against Latha Rajinikanth, wife of superstar Rajinikanth, in connection with the veracity of a document submitted by her for securing an injunction order, the city police official said on Monday. A lawyer for Rajinikanth's wife, however, dismissed the charge and warned of legal action against the party that had filed the complaint. "The court has referred the matter to the jurisdictional police station which is Ulsoor Gate police station, where a case has been registered. We will investigate it under various sections of the Indian Penal Code, including Section 420," said Police Commissioner MN Reddy. 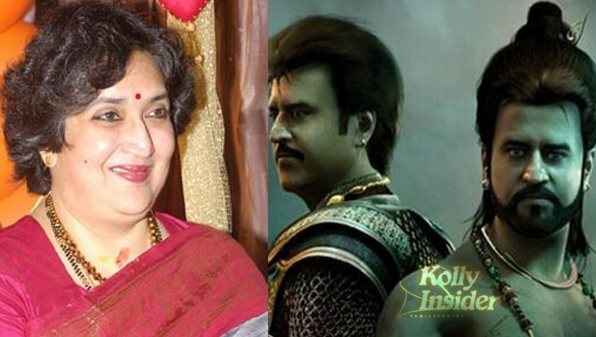 Latha Rajinikanth secured a gag order against media in December 2014 from airing an alleged financial dispute between her and Chennai-based Ad Bureau Associates, which emanated during the post-production of the movie "Kochadaiyaan" in which her husband acted. "A dispute arose between both these parties and this particular matter was being covered in various news channels and media and papers in Chennai," said Reddy about the original controversy. "At that point in time, (Latha) Rajinikanth appeared before a court through a lawyer and requested an injunction order to restrain these media groups from airing these news. And she secured an injunction order," he added. However, Ad Bureau Associates alleged in another court that the document produced by Latha Rajinikanth is purportedly fake and endorsed by a non-existing media association, said Reddy. Meanwhile, Shyamsundar, the lawyer representing Latha Rajinikanth, said that Ad Bureau Associates is trying to use the vulnerabilities of his client's celebrity status. "Having failed in all their ill-minded efforts, they have gone to the magistrate's court and have filed private complaint under Section 200 of the Criminal Procedure Code," he said. "Generally the protocol is that whenever a private complaint is filed, the magistrate would refer it for an investigation. It is at that stage, and it is totally a false complaint and there is absolutely no fabrication of documents...nothing has been complained," he added. "It is sheer case of blackmailing and we are going to take very very serious legal action," said Shyamsundar.